Summer gets ahead of itself, as a heat wave brews in the D.C. area a few days before spring officially says so long. Overnight temperatures will dip into the high 60s and low 70s before jumping back up to the 90s on Monday. WASHINGTON — It’s going to be hot on Sunday. And it might be even worse on Monday and Tuesday. Even though the summer season doesn’t start until June 20, the D.C. area will be coping with a heat wave starting on Sunday. Storm Team4 meteorologists were tracking a possible heat wave — a stretch of three consecutive days with temperatures above 90 degrees — but Sunday’s high was one degree shy of 90 degrees. So, it’s not officially a heat wave. But that does’t mean it didn’t feel like 100 degrees with the humidity. The National Weather Service said temperatures overnight would dip down into the high 60s and low 70s, before jumping back up to the 90s on Monday. The rise of the mercury accompanies the threat of an isolated thunderstorm Sunday, Storm Team4 meteorologist Somara Theodore said. The National Weather Service also said showers and thunderstorms shouldn’t be ruled out for Sunday’s forecast, especially in central Virginia. The National Weather Service has issued a Code Orange air quality alert for Sunday. This means that air pollution concentrations within the region may become unhealthy for sensitive groups, such as children, people with asthma and other heat and lung diseases, and the elderly. Records could be broken on Monday and Tuesday, with temperatures in the 90s. And, the humidity will make it feel even warmer, the National Weather Service said. It will feel as if it’s in the triple digits. 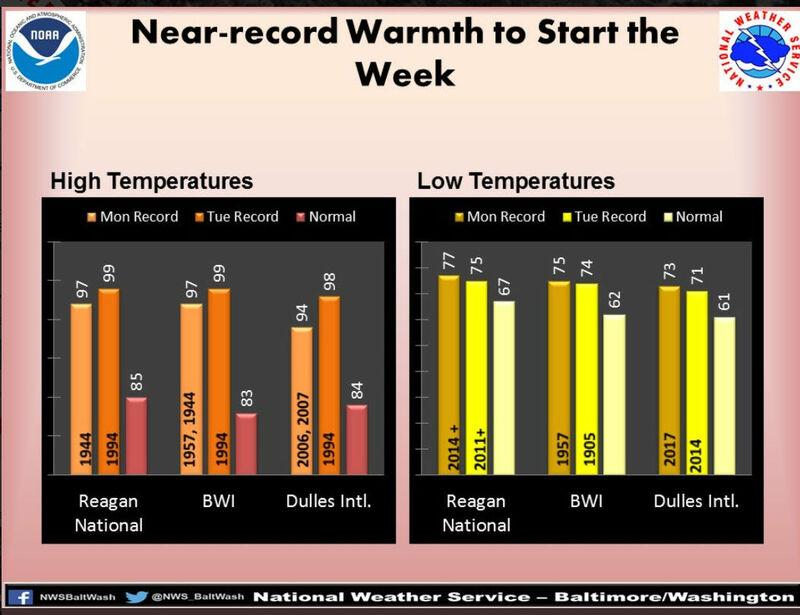 Tuesday record highs are 99 degrees for Reagan National and BWI Marshall set in 1994; and 98 degrees for Dulles in 1994. Sunday: Partly sunny, hot and humid. Chance of isolated thunderstorm. Highs in the low to mid 90s. Heat index near 100. Monday: Mostly sunny, very hot and very humid. Highs in the upper 90s. Heat index between 100 to 105. Tuesday: Partly sunny, very hot and humid. Highs in the mid to upper 90s. Heat index between 100 to 105. Before the heat set in, the D.C. area enjoyed pleasant weather. Storm Team4 meteorologist Matt Ritter said that the system that brought on those pleasant temperatures may actually be to blame for the heat wave. And if you’re heading out to the beach, get the latest beach traffic and weather information from WTOP.